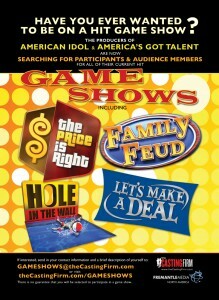 Our friends at “The Casting Firm” sent us this exciting update for game show fans! If you’d like to be a contestant on any of the following shows: The Price is Right, The Family Feud, Let’s Make a Deal, or Hole in the Wall, please read the message below on how to do it! 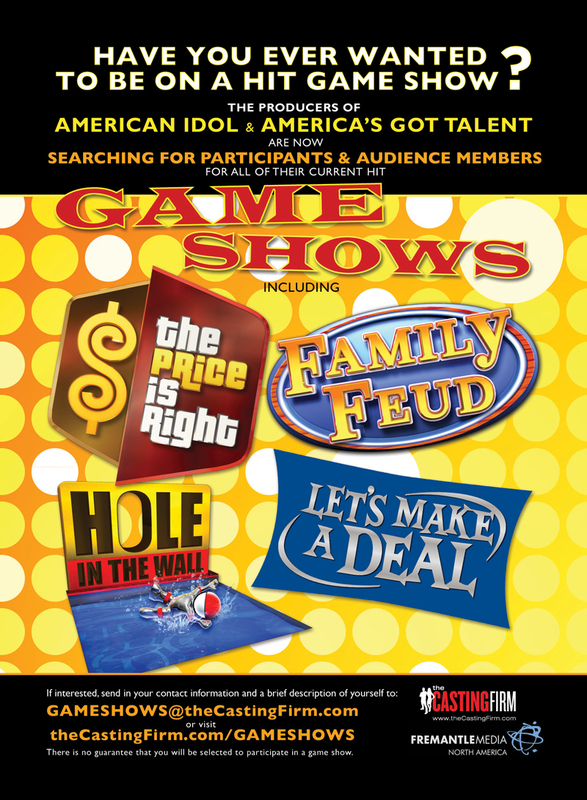 The Casting Firm has been hired by FremantleMedia (the media giant behind our favorite game shows and hits such as American Idol, X Factor, Americaâ€™s Got Talent) to oversee a general game show contestant department. We are searching for contestants and audience members for ALL of their current hit game shows (stated above). This is an exciting opportunity to be seen by the Contestant Department for a multitude of shows! Not only are we seeking people for these huge iconic hit shows, weâ€™re also looking for potential contestants for brand new shows that haven’t been announced yet and projects that are currently in development here (and there are lots, it’s going to be an exciting summer!). People can basically come in and be seen by us for any of the FremantleMedia shows! We bring in fun real people to be on our shows – anyone outgoing, spontaneous, expressive, quick decision makers. Everything from people who are great at trivia, really coordinated, street smart, to just overall fun people that the viewers will be rooting for! Men and women (18+) of all types, all backgrounds. It’s for a variety of shows, so they can submit as an individual, with friends, coworkers, as married or engaged couples, with their families, sports teams, social group, etc..
Also, If anyone is not from Southern California and will be traveling here, they can shoot us an email, let us know about them and when theyâ€™ll be in town â€“ maybe weâ€™ll have the perfect show for them to attend either as a contestant or audience member!